My good friends Tom, Jim, and I went fish killing this weekend. We went up to the woods of east Texas and fished on the Sabine river. We were guided by Simon, part of River Ridge, and he did a great job. We didn't get as many as we wanted (75), but we got enough (27). It was fun to have someone else do the baiting, netting, and cleaning of the fish. And many thanks to my boss, Kurt, for funding this good time. An atheist says, "I truly believe Africa needs God"
This is a really good article. Very insightful. Matthew Parris is someone who knows Africa. He grew up there and has extensively traveled throughout the continent. He doesn't explain why he is "Now a confirmed atheist", but he doesn't let that get in the way of truly seeing the good that comes from Christian conversion. Here's the article by Matthew Parris at Times Online. Well, we did it again. My Sunday School class made Manna Bags. They are bigger and better than last years. But, what is a Manna Bag? Well, it comes from the Old Testament story in Exodus chapter 16. Manna was the bread like substance that God provided to the Jews as they crossed the desert on their way to the promise land. It was a daily miracle of God for the sustenance of the people. Our Manna Bags are kind of like that. They are a day's worth of sustenance that we give to the beggars/homeless on the street corners. 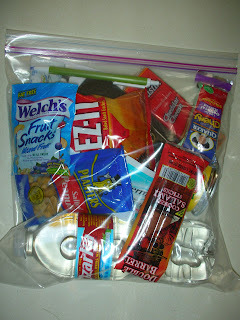 This year our Manna Bags have: an Oatmeal Raisin bar, bag of salted peanuts, cooked salami sticks, a bag of cheez-it, fruit snack, cheddar cheese crackers, lolly pop, can of mixed fruit with a plastic spoon, bottle of water, antibacterial soft wipe, travel size tooth paste and tooth brush, stamped envelope with a sheet of paper (so they can write a letter), pen, a Gideons New Testament, and a gospel tract. All of this is stuffed into a gallon size zip lock bag. Here's a picture. Click on the picture for a larger version.